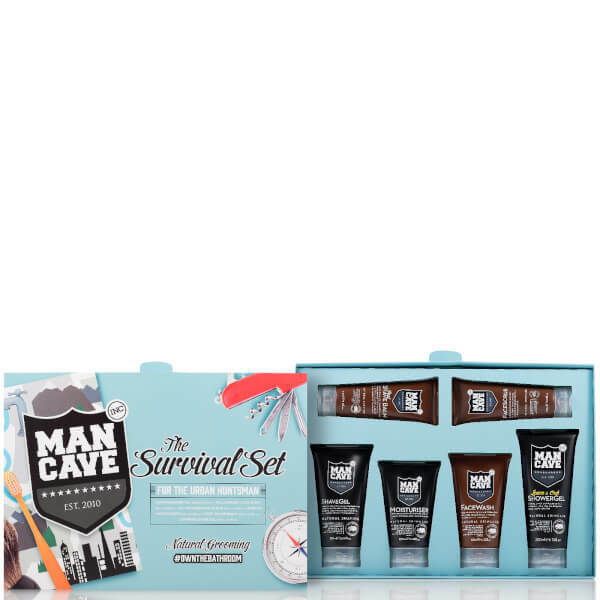 Look and feel like a new man with the ManCave Survival Gift Set; six grooming essentials that work in tandem to refresh, hydrate and soothe, whilst allowing a close, comfortable shave. Presented in a gift box. A lightweight, refreshing formula to naturally cleanse and hydrate skin. Infused with Lemon Oil, Vetiver and Bergamot, the body wash effortlessly eliminates dirt and impurities, whilst imparting an uplifting fragrance to stimulate the skin and senses. The body will be left soft, smooth and deeply revitalised. A revitalising formula that works to eliminate excess oil, dirt and impurities without over-drying or uncomfortable tightness. Harnessing the powers of Willow Bark, Green Tea and Spinach, the antioxidant-rich face wash expertly cleanses skin, whilst defending against environmental aggressors. Skin is smooth, invigorated and deeply hydrated. Effectively exfoliate and refine skin without over-drying or uncomfortable tightness. Fortified with fine Olive Stone granules, the powerful scrub buffs away dirt and dead skin cells, whilst Aloe Vera and Grapeseed Oil deliver intense hydration to reveal a smoother, softer texture. Helps to rebalance oily skin, decongest blocked pores and eliminate blackheads and ingrowing hairs. A fast-absorbing, non-greasy formula that works to hydrate, mattify and energise skin. Fortified with stimulating Caffeine, Organic Borage Oil and Shea Butter, the lightweight emulsion delivers intense, long-lasting moisture, whilst antioxidant Vitamin E shields from free radical damage and environmental aggressors. Skin is smooth, rejuvenated and protected. Achieve a smooth, clean shave with the lightweight shave gel, developed to create a protective veil over skin for superior razor glide. 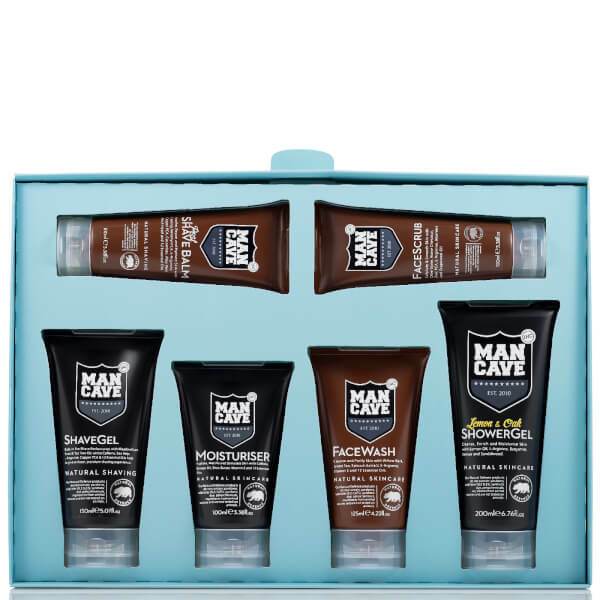 Fortified with Meadowfoam Seed, Tea Tree Oil and Caffeine, the naturally foaming gel moisturises and hydrates skin, whilst lifting and softening facial hair to allow you to experience a close, high performance shave. Infuses skin with a rich Cedarwood fragrance. 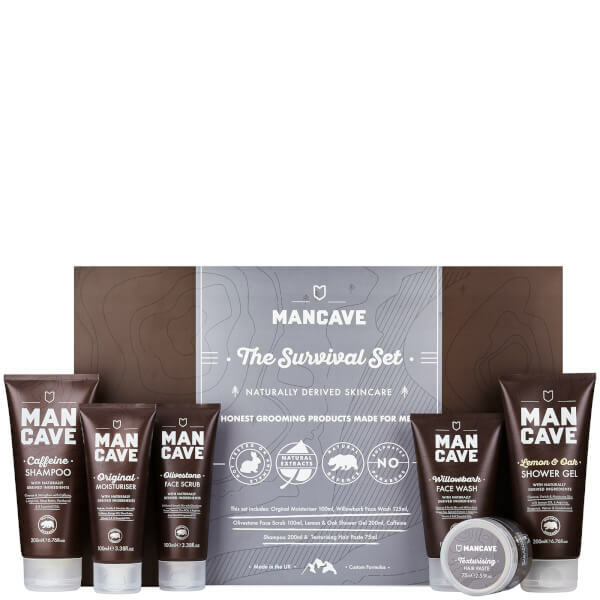 A lightweight, rejuvenating formula developed specifically for men. Fortified with Cucumber, Aloe Vera and Witch Hazel, the alcohol-free balm helps to relieve razor burn and irritation, whilst closing the pores to prevent ingrowing hairs. Delivers a pleasant cooling sensation to leave skin smooth and comfortable. Shower Gel: Step into a steaming shower and squeeze a pebble-sized amount into your palms. Massage over body until suitably lathered. Rinse. Face Wash: Squeeze a penny sized amount onto your fingertips and gently massage to face and neck until suitably lathered. Then gently rinse with clean, warm water. Repeat the cleansing process in the evening before you sleep. Face Scrub: Apply face scrub onto wet skin. Massage onto face and neck in small circular motions and rinse with warm water. Use twice weekly. Moisturiser: Squeeze a pea sized amount onto your fingertips and gently massage to face and neck until fully absorbed. Shave Gel: Lather a small amount into your palm, shaving mug or directly on to your face with a shaving brush (or your fingers). Apply to beard in a circular motion. Proceed to shave as normal. Rinse with warm water and follow with cold water to seal pores. Post Shave Balm: Massage liberally onto shaven area until absorbed and enjoy the soothing sensation. Shower Gel: Aqua (Water), Cocamidopropyl Betaine, Sodium Cocoamphoacetate, Glycerin, Decyl Glucoside, Aloe Barbadensis Leaf Juice, Sodium Chloride, Parfum (Fragrance), Citrus Limon (Lemon) Peel Oil, Rosmarinus Officinalis (Rosemary) Leaf Oil, Vetiveria Zizanoides Root Oil, Artemisia Herba-Alba Oil, Citrus Aurantium Dulcis (Orange) Peel Oil, Elettaria Cardamomum Seed Oil, Citrus Aurantium Amara (Bitter Orange) Leaf/Twig Oil, Arginine, Acrylates /C10-30 Alkyl Acrylate Crosspolymer, Phenoxyethanol, Xanthan Gum, Benzoic Acid, Dehydroacetic Acid, Potassium Sorbate, Citric Acid, Limonene, Linalool, Alpha-Isomethyl Ionone. Face Wash: Aqua (Water), Glycerin, Cocamidopropyl Betaine, Lauryl Glucoside, Sodium Cocoamphoacetate, Sodium Chloride, Aloe Barbadensis Leaf Juice, Arginine, Camellia Sinensis (Green Tea) Leaf Extract, Salix Nigra (Willow) Bark Extract, Spinacia Oleracea (Spinach) Leaf Extract, Tocopherol, Xanthan Gum, Parfum (Fragrance), Bulnesia Sarmientoi Wood Oil, Rosmarinus Officinalis (Rosemary) Leaf Oil, Lavandula Hybrida Oil, Cedrus Atlantica Bark Oil, Abies Sibirica Oil, Eucalyptus Globulus Leaf Oil, Citrus Aurantifolia (Lime) Oil, Artemisia Herba-Alba Oil, Origanum Majorana Herb Oil, Juniperus Communis Fruit Oil, Piper Nigrum (Pepper) Fruit Oil, Thymus Vulgaris (Thyme) Flower/Leaf Oil, Abies Balsamea Extract, Phenoxyethanol, Coco-Glucoside, Glyceryl Oleate, Sodium Cocoyl Glutamate, Sodium Lauryl Glucose Carboxylate, Acrylates /C10-30 Alkyl Acrylate Crosspolymer, Citric Acid, Isopropyl Alcohol, Potassium Sorbate, Sodium Benzoate, Hydrogenated Palm Glycerides Citrate, Benzyl Salicylate, Coumarin, Hexyl Cinnamal, Linalool. Face Scrub: Aqua (Water), Aloe Barbadensis Leaf Juice, Caprylic/Capric Triglyceride, Cetyl Alcohol, Ethylhexyl Stearate, Glycerin, Polyglyceryl-3-Methylglucose Distearate, Butyrospermum Parkii (Shea Butter), Helianthus Annuus (Sunflower) Seed Oil, Zea Mays (Corn) Starch, Ethylhexyl Salicylate, Octocrylene, Cetearyl Glucoside, Borago Officinalis Seed Oil, Arginine, Caffeine, Tocopheryl Acetate, Parfum (Fragrance), Bulnesia Sarmientoi Wood Oil, Rosmarinus Officinalis (Rosemary) Leaf Oil, Lavandula Hybrida Oil, Cedrus Atlantica Bark Oil, Abies Sibirica Oil, Eucalyptus Globulus Leaf Oil, Citrus Aurantifolia (Lime) Oil, Artemisia Herba-Alba Oil, Origanum Majorana Herb Oil, Juniperus Communis Fruit Oil, Piper Nigrum (Pepper) Fruit Oil, Thymus Vulgaris (Thyme) Flower/Leaf Oil, Abies Balsamea Extract, Sodium Polyacrylate, Cetyl Esters, Phenoxyethanol, Benzoic Acid, Dehydroacetic Acid, Citric Acid, Potassium Sorbate, Benzyl Salicylate, Coumarin, Hexyl Cinnamal, Limonene, Linalool, Alpha-Isomethyl Ionone. Moisturiser: Aqua (Water), Aloe Barbadensis Leaf Juice, Caprylic/Capric Triglyceride, Cetyl Alcohol, Ethylhexyl Stearate, Glycerin, Polyglyceryl-3-Methylglucose Distearate, Butyrospermum Parkii (Shea Butter), Helianthus Annuus (Sunflower) Seed Oil, Zea Mays (Corn) Starch, Ethylhexyl Salicylate, Octocrylene, Cetearyl Glucoside, Borago Officinalis Seed Oil, Arginine, Caffeine, Tocopheryl Acetate, Parfum (Fragrance), Bulnesia Sarmientoi Wood Oil, Rosmarinus Officinalis (Rosemary) Leaf Oil, Lavandula Hybrida Oil, Cedrus Atlantica Bark Oil, Abies Sibirica Oil, Eucalyptus Globulus Leaf Oil, Citrus Aurantifolia (Lime) Oil, Artemisia Herba-Alba Oil, Origanum Majorana Herb Oil, Juniperus Communis Fruit Oil, Piper Nigrum (Pepper) Fruit Oil, Thymus Vulgaris (Thyme) Flower/Leaf Oil, Abies Balsamea Extract, Sodium Polyacrylate, Cetyl Esters, Phenoxyethanol, Benzoic Acid, Dehydroacetic Acid, Citric Acid, Potassium Sorbate, Benzyl Salicylate, Coumarin, Hexyl Cinnamal, Limonene, Linalool, Alpha-Isomethyl Ionone. Shave Gel: Aqua (Water), Aloe Barbadensis Leaf Juice, Glycerin, Cocamidopropyl Betaine, Decyl Glucoside, Sodium Lauroyl Sarcosinate, Acrylates /C10-30 Alkyl Acrylate Crosspolymer, Copper PCA, Arginine, Caffeine, Fucus Vesiculosus Extract, Limnanthes Alba (Meadowfoam) Seed Oil, Panthenol, Melaleuca Alternifolia (Tea Tree) Leaf Oil, Phenoxyethanol, Sodium Chloride, Parfum (Fragrance), Bulnesia Sarmientoi Wood Oil, Rosmarinus Officinalis (Rosemary) Leaf Oil, Lavandula Hybrida Oil, Cedrus Atlantica Bark Oil, Abies Sibirica Oil, Eucalyptus Globulus Leaf Oil, Citrus Aurantifolia (Lime) Oil, Artemisia Herba-Alba Oil, Origanum Majorana Herb Oil, Juniperus Communis Fruit Oil, Piper Nigrum (Pepper) Fruit Oil, Thymus Vulgaris (Thyme) Flower/Leaf Oil, Abies Balsamea Extract, Sodium Hydroxide, Benzoic Acid, Sodium Laurate, Dehydroacetic Acid, Potassium Sorbate, Sodium Sarcosinate, Citric Acid, Sodium Benzoate, Benzyl Salicylate, Coumarin, Hexyl Cinnamal, Linalool. Post Shave Balm: Aqua (Water), Aloe Barbadensis Leaf Juice, Glycerin, Limnanthes Alba (Meadowfoam) Seed Oil, Tapioca Starch Polymethylsilsesquioxane, Hamamelis Virginiana (Witch Hazel) Water, Opuntia Ficus-Indica Stem Extract, Cucumis Sativus (Cucumber) Seed Oil, Creatine, Arginine, Panthenol, Menthyl PCA, Copper PCA, Phenoxyethanol, Carbomer, Parfum (Fragrance), Bulnesia Sarmientoi Wood Oil, Rosmarinus Officinalis (Rosemary) Leaf Oil, Lavandula Hybrida Oil, Cedrus Atlantica Bark Oil, Abies Sibirica Oil, Eucalyptus Globulus Leaf Oil, Citrus Aurantifolia (Lime) Oil, Artemisia Herba-Alba Oil, Origanum Majorana Herb Oil, Juniperus Communis Fruit Oil, Piper Nigrum (Pepper) Fruit Oil, Thymus Vulgaris (Thyme) Flower/Leaf Oil, Abies Balsamea Extract, Potassium Sorbate, Citric Acid, Sodium Benzoate, Benzyl Salicylate, Coumarin, Hexyl Cinnamal, Limonene, Linalool, Alpha-Isomethyl Ionone. Beautiful set for exceptional price. Wonderful smell.